If you live on Florida’s coast, or you own residential or commercial property near the ocean, you know that you need storm protection. That’s a given. But there are other types of building protection you can’t overlook either. If you don’t have strong shutters on your windows and doors, you may be leaving your home or business open to several types of expensive and inconvenient damage. Fortunately for home and business owners in Vero Beach, protecting your property is easy with roll-down shutters from Empire Construction & Development. 1. Rolling shutters protect your home or business from theft. If your neighborhood in Indian River County has recently had a rash of break ins, or even if it hasn’t, protecting your home or commercial building from theft is a smart move. Whether you’re worried about home break-ins, looting after a storm, or both, sturdy aluminum roll-down security shutters from Empire Construction & Development can be used to securely cover your windows, glass doors, and other areas on your home and business in Vero Beach, Florida. 2. Roll-down shutters protect your home or business from vandalism. You never know when a random act of damage to your home, restaurant, bar, hotel, or store in Vero Beach, Florida may occur. And while your security cameras may capture a video of the vandalism, you can prevent property damage from happening by installing roll-down security shutters on your windows and doors. 3. Rolling shutters protect your privacy. With roll-down shutters from Empire Construction & Development, you can cover your windows and sliding doors overnight, or whenever you want more privacy than blinds and curtains can provide. Keep people from peering into your home, office, or storefront window with secure roll-down shutters from Empire Construction & Development. 4. Roll-down shutters protect against sun damage. The Florida sun can be brutal on the interior of your home. If you have furniture, artwork, or other valuables you want to protect from damaging UV rays – roll-down shutters from Empire Construction & Development will completely block the sun from entering one or more of your rooms. 5. Rolling shutters protect your home or business against storms. Of course, you can’t forget about hurricane protection if you’re in Florida. Roll-down storm shutters from Empire Construction & Development are made to protect homes and businesses in Vero Beach, Florida from hurricanes, tropical storms, and other seasonal storms. These shutters let you protect your building from an incoming storm quickly and easily. 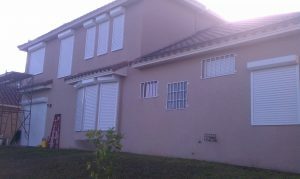 Find the roll-down shutters in Vero Beach that you’re looking for at HurricaneShuttersFlorida.com. For a free quote on the cost of roll-down shutters in Vero Beach, contact us today or call: 888-474-3555 to hear about this month’s rolling shutter deals. Protect your home or business in Vero Beach, Florida from any type of threat with roll-down security and storm shutters from Empire Construction & Development. With its beautiful architecture, impeccable landscaping, and beachy ambience, Boca Raton is known for being one of the most beautiful cities in South Florida. From beautiful college campuses, to snow birds looking to get away from the cold weather up north, to residents living a luxurious lifestyle, Boca Raton is home to a variety of people from near and far. Despite their differences, every person obtains the same desire- to experience a better life under the Florida sun surrounded by Boca Raton’s magnificent environment. If you live in Boca Raton, you probably care a lot about your residence’s appearance and protection, lucky for you, Empire Construction & Development offers something to help you protect your home while enhancing its look. Rolling shutters are one of the many high-quality storm protection products that Empire Construction & Development builds. Rolling shutters are accepted by the Miami-Dade County product control division, Florida Building Code, and the International Building Code. These roll-down shutters are made of strong aluminum for maximum durability to protect your home from hurricanes, strong winds and debris, heavy rain, and tornados. Stop wasting time boarding up your house every time a storm alert is out and just conveniently crank down your shutters. Rolling shutters are quick and easy to install and even more effortless to roll down. Our rolling shutters come with a smooth, manual crank that can be upgraded to an electric motor drive with a manual over-ride for an even easier option. Our sleek roll-down shutters are custom made and are a positive addition to any home. Our carefully engineered shutters are available in many colors such as white, ivory, beige, and bronze so that they can blend in with the aesthetics of any type of residential and commercial building. All our shutters can be shipped worldwide. If you are a homeowner or business owner in Boca Raton you are in luck because the company offers a lower shipping costs to residents of the Southern Palm Beach, North Miami-Dade, and Broward County. Empire Construction & Development is now offering the option to pay in segments by using PayPal. If you’ve made the smart decision to protect your home, hotel, restaurant, or other business by installing our quality rolling shutters, rest assured that Empire Construction & Development offers its customers a guaranteed five-year warranty. Rolling shutters can also provide security, increase privacy, protect furniture from sun-exposure, and reduce noise. If you are looking for a cost-effective way to keep your home or business safe, then rolling shutters are the perfect item for you. Contact us for any questions you have or call: 888-474-3555 for a FREE estimate on the cost of buying rolling shutters in Boca Raton, Florida. Hurricane shutters are a necessity for dwellers of coastal regions in the U.S. Roll-down hurricane shutters are widely preferred by home-owners for a number of reasons. Not only are these convenient and easy to deploy; they provide excellent protection from all kinds of debris that doors and windows would otherwise be vulnerable to. 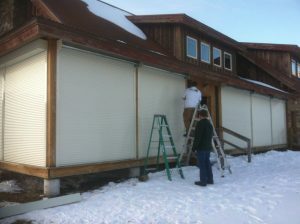 Once installed roll-down hurricane shutters don’t have to be removed and stored away once the season is over. They are placed above the opening and pulled down either by hand, by a crank, or an electric motor – not very different from aluminum garage doors. Another benefit of these shutters is that they can keep light, heat, and dust out of the rooms. This keeps the paint fresh, delays fading, and furnishings clean. They also keep out external noise and add to the peace of your surroundings. 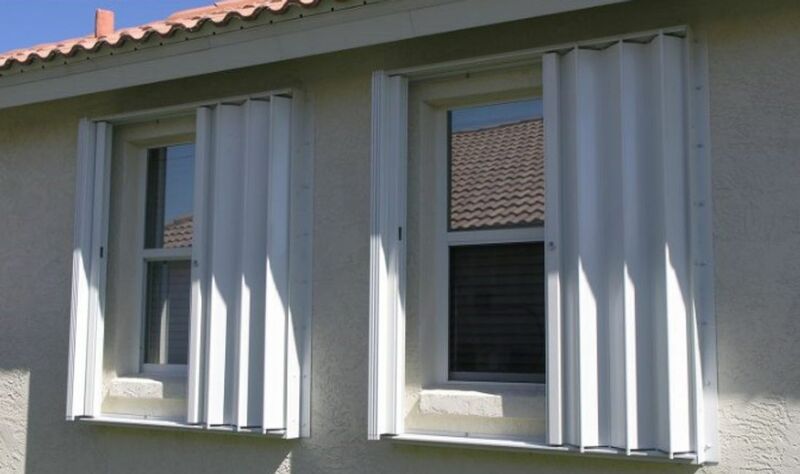 Your roll down hurricane shutters will protect you from hurricane force winds. You can actually pull down the shutters remotely via electric buttons. There are enough and more color schemes to meet your discerning standards. The machine-formed aluminum hoods that contain the rolled up shutters are of sturdy construction. The reel on which the shutter is rolled over is rigidly fastened to the sides of the housing and is resilient. The housing is caulked and weather-proofed. 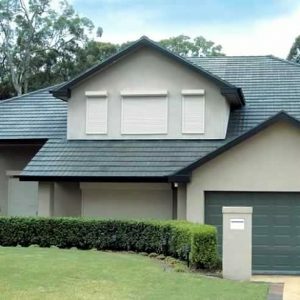 If you choose to installed motorized roll over storm shutters then ensure that the company sends over a qualified electrician who wires the assembly properly and in a safe manner. You can compare rates online; get your questions answered; and find out the level of testing done on the shutters you choose to install.